Bell's palsy see bell's palsy. cerebral palsy see cerebral palsy. crossed leg palsy palsy of the fibular nerve, caused by sitting with one leg crossed over the other. Erb's palsy (Erb-Duchenne palsy) Erb-Duchenne paralysis. 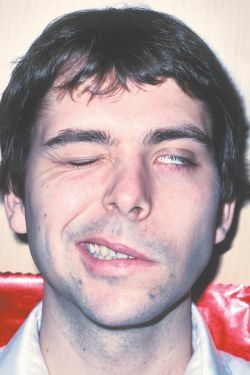 Bell's palsy unilateral facial paralysis of sudden onset due to a lesion of the facial nerve, resulting in characteristic facial distortion. cerebral palsy any of a group of persisting qualitative motor disorders appearing in young children, resulting from brain damage caused by birth trauma or intrauterine pathology. Erb's palsy , Erb-Duchenne palsy Erb-Duchenne paralysis. progressive bulbar palsy chronic, progressive, generally fatal paralysis and atrophy of the muscles of the lips, tongue, mouth, pharynx, and larynx due to lesions of the motor nuclei of the lower brain stem, usually occurring in late adult years. wasting palsy spinal muscular atrophy. Complete or partial muscle paralysis, often accompanied by loss of sensation and uncontrollable body movements or tremors. b. To deprive of strength. 2. To make helpless, as with fear. an abnormal condition characterized by paralysis. Some kinds of palsy are Bell's palsy, cerebral palsy, and Erb's palsy. Neurology Complete paralysis, see there, of a particular body region or extremity, rendering the region incapable of voluntary motor activity. See Bell's palsy, Cerebral palsy, Crutch palsy, Erb's palsy, Facial palsy, Progressive supranuclear palsy, Pseudobulbar palsy, Saturday night palsy. An obsolete term for PARALYSIS, retained for historical reasons in a few cases such as those of BELL'S PALSY and CEREBRAL PALSY. Synonym for paralysis, although it often implies partial paralysis. See paralysis; paresis. abducens nerve palsy See paralysis of the sixth nerve. Bell's palsy A paralysis of the upper and lower muscles of the face on one side, due to an inflammation of the facial nerve. It results in a wider palpebral aperture and inability to close the eye on the affected size and drying of the cornea. See Bell's sign; artificial tears; crocodile tears. double elevator palsy A condition characterized by limited or complete inhibition of the upward rotation of an eye, due either to paresis of its superior rectus and inferior oblique muscles, or to entrapment of the inferior orbital tissues. It may be congenital or acquired (e.g. a lesion in the pretectum). Treatment is principally surgical. gaze palsy Inability of the eyes to make conjugate movements due to a lesion in the cortical or subcortical oculomotor centres. See paralysis of the fourth nerve; paralysis of the sixth nerve; paralysis of the third nerve. supranuclear gaze palsy A disturbance of the conjugate movements of the eye. If the lesion is in the frontal lobe, the patient is unable to direct the eyes to the contralateral side of the lesion (frontal gaze palsy). In bilateral lesion the patient is unable to turn the eyes voluntarily in any direction but is able to maintain fixation and perform pursuit movements. If the lesion is in the midbrain it produces Parinaud's syndrome, in which there is an inability to elevate (and sometimes depress) the eyes on command and the pupils are large and may not react to light. If the lesion is in the paramedian pontine reticular formation there is ipsilateral horizontal gaze palsy, while lesions in the medial longitudinal fasciculus produce internuclear ophthalmoplegia. See internuclear ophthalmoplegia. paralysis but preferred by some to refer to certain types of paralysis. n.pr facial paralysis believed to result from inflammation in or around the facial nerve. One side of the face sags, the corner of the oral cavity droops, the eyelid does not close, and saliva dribbles from the corner of the oral cavity on the affected side. See also paralysis, facial. n 1. a collective term for neurologic defects with associated disturbances of motor function. The disturbances vary in cause and anatomic type (e.g., acquired, hereditary, natal, postnatal, congenital palsy). n 2. a nonspecific term representing a group of pathologic conditions having the following common, related characteristics: agenesis, or a lesion of nervous tissue within the cranium; interference with voluntary muscular movements; disabling disorders of a chronic nature, neither acute nor progressive; and occurrence of the original lesion at the date of birth of the patient or before the development of learned muscular function. 3. a condition caused by damage to the motor centers of the brain, resulting in varying disturbances of motor function and often accompanied by mental subnormality. n paralysis of the muscles supplied by the seventh cranial nerve. It may be associated with peripheral lesions, neoplasms invading the temporal bone, acoustic neuromas, pontine disease, and herpes zoster involving the geniculate ganglion. Bilateral paralysis may occur in uveoparotid fever and polyneuritis. n a weakness and paralysis of the hand, wrist, and fingers, associated with lead poisoning. See also lead (Pb). paralysis. A word used commonly in human medicine but rarely if ever in veterinary medicine. Q. What Is Bell's Palsy? A friend of mine has been told she has Bell's palsy. What happens in this disease? A. Bell's palsy is defined as an idiopathic (from an unknown reason) unilateral facial nerve paralysis, usually self-limiting. The trademark is rapid onset of partial or complete palsy, usually in a single day. Q. What are the causes of bell's palsy? A. I had it 5 years ago at age 20. All the symptoms of the above are correct not to mention the tiredness and rapid blinking of the eye from the effected side. In my case I have just found out that I have a non milignate tumor behind my left eye which was likely to be the cause of the Bell Pausy in the first place. I encourage anyone who has symptoms or pain spanning more than 8 weeks to see their doctor and if possible request request or demand a MRI scan for peace of mind. If pain persists get a second opinion and dont let the Dr. shrugg you off. Q. I go to sleep & use to wake up paralyzed in my sleep. I go to sleep & use to wake up paralyzed in my sleep. But not asleep, just laying there, eyes wide open paralyzed. I couldn't breath, I couldn't speak, move anything but my eyes. I could look around but I couldn't even breathe. This has happened a few times in my old house, once in my mother's house (she lived by the side of a graveyard), and then only once in my new house. What is it and what do you think is causing it? A. I had the same problem but never at night...and it only happened during the day when I take nap. I will wake up and I can't move or talk, I can't open my eyes either. I've never been able to snap out of it though, I just have to lay there until I go back to sleep, and usually it doesn't happen when I wake up the next time. Needless to say I try NOT to take naps anymore, because it happens nearly every time.